In 2015, two million people had a prescription opioid use disorder and 591,000 suffered from a heroin use disorder; prescription drug misuse alone cost the nation $78.5 billion in healthcare, law enforcement, and lost productivity. But while the scope of the crisis is staggering, it is not hopeless. We understand opioid addiction better than many other drug use disorders; there are effective strategies that can be implemented right now to save lives and to prevent and treat opioid addiction. At the National Rx Drug Abuse and Heroin Summit in Atlanta, GA last month, lawmakers and representatives from healthcare, law enforcement, and many private stakeholders from across the nation affirmed a strong commitment to end the crisis. Research will be a critical component of achieving this goal. 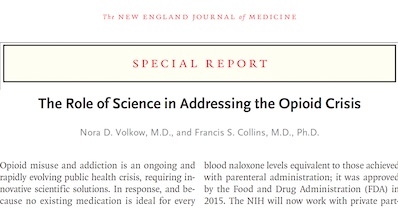 Today in the New England Journal of Medicine, we laid out a plan to accelerate research in three crucial areas: overdose reversal, addiction treatment, and pain management. First, there is a need to develop additional overdose-reversal interventions and improved formulations of naloxone to reduce mortality. Naloxone is very effective at reversing overdoses, but bystanders may not reach the person in time and the usual doses given may not be powerful or long-lasting enough to reverse overdoses on fentanyl and other highly potent synthetic opioids. In addition to new or differently formulated antagonists of the mu-opioid receptor, other targets such as the 5HT1A receptor (a serotonin receptor) may hold promise as alternative ways of reversing respiratory depression caused by opioid overdose. Research is also needed to develop technologies that can detect an overdose and signal for help as well as intervene automatically to stimulate respiration. We must also develop better strategies to effectively engage people who have overdosed in addiction treatment. Second, we need new, innovative medications and technologies to treat opioid addiction. The existing opioid agonist (methadone), partial agonist (buprenorphine), and antagonist (naltrexone) medications effectively reduce illicit opioid use when they are provided at a sufficient dose and patients adhere to their treatment plan—but not all patients respond to these medications. Our growing knowledge of the neurobiology of opioid addiction has helped researchers to identify novel molecular targets (such as the kappa-opioid receptor and serotonin receptors) and new ways of modifying brain circuits that may produce more effective and safer treatments for opioid use disorders. Among the novel approaches in development are vaccines that recruit the body’s immune system to prevent opioids from entering the brain; these have already shown great promise in animal studies. Third, we need safe, effective, non-addictive treatments to manage chronic pain. While there were nearly 20,000 overdoses in 2015 due to heroin or fentanyl, the trajectory of opioid addiction usually begins with prescription opioid misuse. Some people with opioid addiction began by taking diverted pills from friends and family members, but others began with an opioid prescription of their own. But simply reducing medical use (and thus supply) of addictive prescription opioids, as the CDC and other authorities have recently advised, does not address the very real problem of untreated pain in this country, and we cannot solve the opioid addiction and overdose crisis without better addressing pain at the same time. New pain treatments need to be developed, and the last few years have seen exciting developments in this area. For example, compounds called biased agonists that produce pain relief via the mu-opioid receptor but without the rewarding and respiratory depressing effects produced by currently approved opioid medications have recently shown promise in animal studies. Non-opioid-based approaches like cannabinoids, sodium channel blockers, gene therapies, and brain-stimulation technologies (such as transcranial magnetic stimulation [TMS], transcranial direct current stimulation, and electrical deep brain stimulation) also may lead to new therapeutics. This initiative will focus on a range of objectives – from easily achievable short-term goals (such as reformulations of existing medications) to research priorities that will take longer to bear fruit. But as announced at the Rx Summit last month, across the board, NIH will be partnering with pharmaceutical industry leaders to cut in half the time it takes to develop new treatments. Public-private partnerships are already a part of the NIH’s “Cancer Moonshot” and other initiatives, and some of the current medications saving lives – such as Probuphine® and Nasal Narcan® – and rescuing opioid users from the grip of addiction were developed through NIDA partnerships with industry. I'm a drug court judge and a member of our state's drug and mental health court coordinating committee. Currently we are working on drafting standards and guidelines for the use of medication assisted treatment in our adult felony drug courts. We encounter resistance to the use of MAT from some law enforcement and treatment members. This blogspot will help persuade some of the skeptics that the scope of the opioid epidemic requires an unbiased assessment of the value of MAT. Thank you for your leadership on this issue. Thank you for advocating for MAT in your state’s drug courts. We have other resources on our site that may also be useful to you as you make the case for wider MAT adoption, including a 2-page fact sheet and a page on evidence for the effectiveness of MAT in criminal justice settings. I've been trained to administer naloxone and we have a good Samaritan law in Washington so I need not worry about liability, but my primary care physician will not write me a prescription for naloxone as he believes that HE wouldn't be immune from suit if he prescribes naloxone to me knowing that it would be administered to a third party. It would be good to either make the drug available through law enforcement without a prescription or amend liability laws so that physicians can prescribe the drug cannot be held liable for the administration of the drug by the patient or others. My observation in working with the large and growing homeless population in Portland, Oregon (and very likely other cities), where opioids have been eliminated or removed from street trade, as they have to some degree, heroin is taking the place of opioids. Is this being observed elsewhere? Yes, there has been a large-scale shift from prescription opioid misuse to heroin in recent years, since heroin is much cheaper and easier to obtain. A growing danger for these users is the risk of heroin (as well as counterfeit prescription drugs purchased on the black market) being contaminated with fentanyl or carfentanyl, very potent synthetic opioids causing rising numbers of deaths in many parts of the country. Is there any research being done on this as a cure for addiction? Why is considered safe in some countries and when will it be available here. I am the parent of a recovering heroin addict and I'm looking for an effective, direct, and meaningful way to get involved in addiction prevention and recovery. What do you suggest? Faces & Voices of Recovery and Partnership for Drug-Free Kids both have “get involved” sections of their websites. CADCA (Community Anti-Drug Coalitions of America) also has opportunities to get involved in substance abuse prevention at the local level. 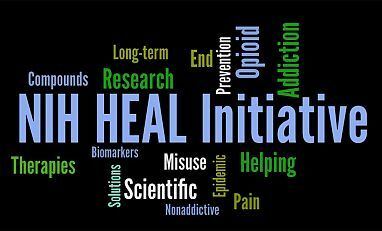 In an effort to combat the opioid epidemic, state governments like Maryland, New York, New Hampshire and Vermont are taking the lead in proposing ibogaine treatment pilot programs for opioid-dependent individuals who do not benefit from conventional treatment methods and interventions for opiate dependence, including opioid replacement therapy; and in evaluating the effectiveness of ibogaine treatment when compared to conventional treatment methods and interventions, including opioid replacement therapy. Can we expect action and support from NIDA and the federal government in investigating this incredibly promising substance? See response to ibogaine query above. Fascinating read. This is the first time I have heard of vaccinations being used. Do those vaccinations target only synthetic opioids, and exclude the natural opioids our brain makes? I live in Utah, and there has been a campaign to help make the general public aware of the availability of Naloxone Rescue Kits, which pharmacists can dispense without a prescription, in an attempt to tackle overdose deaths. Vaccines being developed as treatments for drug addiction are highly drug-specific, and would not affect the body’s endogenous opioids. Vaccines are still in the development stage, so they are likely still years away from being available. I think the World is doing a fine job at it. Make a drug for this, make a drug to counter-act that. Make some additional money to study it. Doing very well. If your back hurts... You'd be better off if you could grow your own poppy. But they don't want you doing that. There's a lot of products on the market someone would rather you buy instead. That's the truth. My name is Holly and I'm Alcohol dependent. I have been sober since 2013 but have attended many court ordered programs including going to prison for drinking. I used to work in the Fed gov as GS 14 before going down. From what I learned in rehab, AA, co-Occuring group, Matrix, and Therapeutic Community is that my disease was progressive and spiraled out of control. But I did not grow up and say gosh I can't wait to be an addict. I can't wait to lose my job, my house, my freedom and have everyone look at me and say change. Like I could just snap my fingers. Getting sober was the hardest thing I ever had to do in my life. Using was the most disgusting, deplorable act I ever did and I wished every day that I would just not wake up. I came pretty close but a cop arrested me and I collapsed in jail 20 days later. I had two surgeries and was in ICU. My husband and kids had no idea. They came to visit me at the jail and were told I was in class. They would not have been told anything unless I died. But we are someone's children and there is something missing in us. I'm scared to death because I've messed up my body so much and broken so many bones that I have opioids. No NSAIDS because stomach damage and no steroids because of bone damage all from alcohol. I have recently discovered NAD IV therapy as a means of treating opioid withdrawal symptoms. The slow drip 10 to 15 day protocol shows anecdotal evidence (80% success rate) among a patient population of 50 opioid addicts. Is there any research supporting this or is it another unfortunate attempt by snake oil salesmen to capitalize on our national tragedy? NAD (nicotinamide adenine dinucleotide) therapy for opioid addiction is not supported by evidence. The medications that have proven useful in the treatment of opioid addiction are buprenorphine, methadone, and extended-release naltrexone. A treatment facility that does not offer these medications for people with opioid addiction is not offering evidence-supported treatment. Hi, Holly. It sounds like you have been strong enough to survive a lot, but are still suffering. I'd suggest that you see if you can get into a multidisciplinary chronic pain program that includes PT, OT, medical supervision, and a psychologist who can teach you self-hypnosis and cognitive/behavioral approaches. Patients usually get about a 40% improvement in pain with those kinds of programs. Good luck! NIDA. "“All Scientific Hands on Deck” to End the Opioid Crisis." National Institute on Drug Abuse, 31 May. 2017, https://www.drugabuse.gov/about-nida/noras-blog/2017/05/all-scientific-hands-deck-to-end-opioid-crisis. NIDA. “All Scientific Hands on Deck” to End the Opioid Crisis. National Institute on Drug Abuse website. https://www.drugabuse.gov/about-nida/noras-blog/2017/05/all-scientific-hands-deck-to-end-opioid-crisis. May 31, 2017.